Blog > Design and Prototyping tools >How to prototype rapidly with Mockplus? 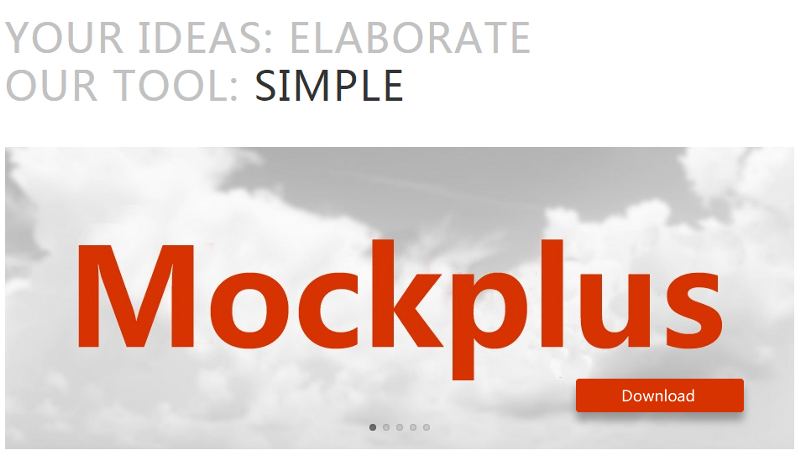 Literally, Mockplus is a rapid, simple and free tool for prototyping, also a stunning new name to prototyping designers. Developed by a group of energetic & inspired young people, this newly started prototyping software, Mockplus, is getting known by numerous designers domestic and overseas. In line with abbreviating, the rapid & simple-oriented principle of Mockplus is well applied by its simple yet powerful functions on the practical design progress. A prototype is an early sample, model, or release of a product built to test a concept or process or to act as a thing to be replicated or learned from. It is a term used in a variety of contexts, including semantics, design, electronics, and software programming. A prototype is designed to test and try a new design to enhance precision by system analysts and users. Prototyping serves to provide specifications for a real, working system rather than a theoretical one. In some workflow models, creating a prototype (a process sometimes called materialization) is the step between the formalization and theevaluation of an idea. Before you decided to design an app, no matter it is desktop app or mobile app, you have to make a clear comprehension of the definition of prototype. Through a clearly understanding of rapid prototyping, that will be helpful to your following work. First, rapid prototyping is a method of quickly creating an early version of a product, that helps to visualize and materialize your ideas. Second, it allows designers to test ideas intuitively and even get user feedback quickly, which can assist on improving and perfecting the ideas. Third, this is procedure is really a worry-saving for designers. Before the final product developed and released, that contributed designers to be time-saving, economically, and effortlessly. Anyway, rapid prototyping is an inevitable method on design works. Relationship between prototype and Mockplus? Learning from the introduction of Mockplus above, it is apparently to see that Mockplus is a professional prototyping tool which is helpful to UI/UX designers. Put another way, Mockplus is the best choice for application prototyping, and the most effective prototyping tool, undoubtedly, it is Mockplus. Simplism style: The spirit of Mockplus team is supplying best services on prototyping elaborate ideas with simple tool. That’s the concept of simplism. The desktop Mocplus displays a simple interface which formed by 3 main parts: component & widget library, working space, project panel. Despite with such a concise and clear layout structure, Mockplus is more powerful than it can be imaged. No specialized knowledge on coding and programming required, users can easily and effectively create application prototyping. Moreover, it does not take too much of time to learn the usage of this simple tool. Rather than wasting unnecessary time on tool learning, it is better to generate more wonderful and ingenious ideas. Abundant icons & components: Mockplus Pro offers almost 200 pre-designed components let you work even faster and easier. Rich components offer users extensive choices for their design work, that can be a good reason for labor-saving. Besides, the 3000 icons are more than enough to be helpful on creating prototypes. Optional prototyping styles: There are two styles available for users to choose when opening Mockplus, sketch and wireframe. Designers can work on any style you preferred. Some enjoy the sketch or hand-drawn style, because that just adds to the authenticity of the prototyping. Any skills or tutorial of how Mockplus is working? Don’t worry, the considerate team has prepared practical and comprehensive tutorials in pages of texts and videos. If there any problems or difficulties, it will be much favorable for users to consult. Some of the topics discussed in the tutorials include how to full-screen preview the exported prototype on mobile devices, creating interactive pages by setting links, creating a longer page for a mobile app, and many more detailed skills. Have you clear how to prototype rapidly with Mockplus? Get a download and give it a try now!